I find myself deeply affected by colour. Colour has the power to change my mood, my feelings, my energy levels, my appetite and many more of my physical, emotional and mental functions. I decided to explore this phenomenon this week and to experiment a bit to learn more about the power of colour. Some people believe that each of our chakras corresponds and responds to a different colour. 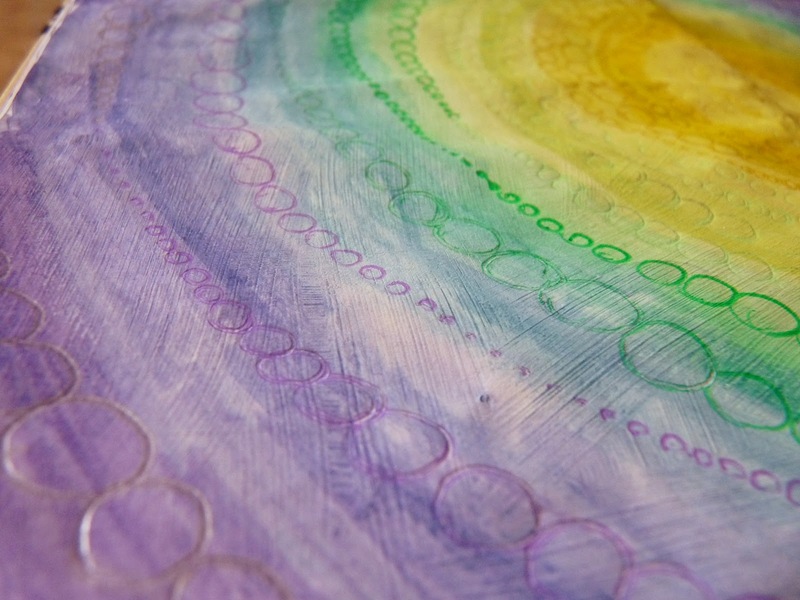 Applying colour to the body in a variety of ways, using coloured light, fabrics or even water that has been 'charged' with a particular colour, is believed to affect these chakras in a way that can be used to bring about healing and balance. Personally, I'm not sure about the effectiveness of these methods of colour therapy. Some of them, particularly the water method, sound a bit wishy-washy to me, but whilst I'm sceptical, I'm also intrigued, as I know I AM affected by colour in many ways. Last week you may remember I made a Brigid's cross out of coloured paper. 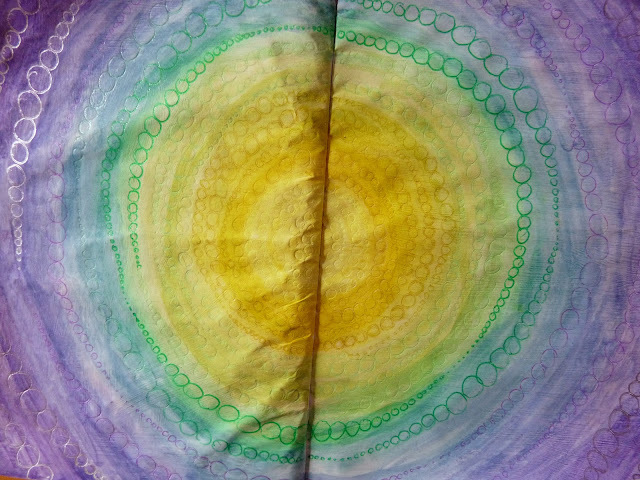 I chose the colours that for me best correspond to Imbolc - white, yellow, pale green and lilac. Whilst choosing these colours for my own Imbolc correspondences, I didn't think too much about it; they seemed to jump out at me very quickly and it was an instinctive decision. Thinking about it later, I realised that these are the colours I see emerging in spring flowers in my locality at this time of year - snowdrops, crocuses, winter aconite etc. I chose pastel shades because I feel these best represent the optimism, inspiration and the very early beginnings of growth of the season. Stronger shades would suggest growth further along in its progression to me. I would add silver to my list of Imbolc colour correspondences too, but I cannot explain why, except to say that this also represents that early emergent growth, optimism, inspiration, etc. to me. In choosing your own colour correspondences, I should advise that you look first to your gut feelings, and then to your thought processes to pick out and finely tune the right colours for you for any given situation. You can use a generic correspondence list for your inspiration, but it is important to adjust and amend these colours as above, and use the list as just a starting point against which to contrast and compare your own feelings and thoughts. You can find colour correspondences for any situation you wish to work with: a time of year, a deity, a more abstract concept such as creativity or community, a physical manifestation such as financial growth or recovery from any particular ailment etc..
Over on Pinterest, I have started to put together some colour correspondence boards to find my own colour correspondences in this way. Up until now I have only begun this process and have a long way to go, but I have two boards under way so far, for 'red' and 'orange', and have started to pick out images that evoke what these colours represent for me. For now I have what I think of as pretty obvious things, like blood, ruby, Mars for red and carrot, orange and tomato soup for orange, but I'm hoping that as I pursue this further, I will accumulate a more thorough and in-depth list of correspondences for many colours. If you wish to have a go at this for yourself and are not already on Pinterest, drop me a line and I'll be happy to send you an invitation (this is needed to join). 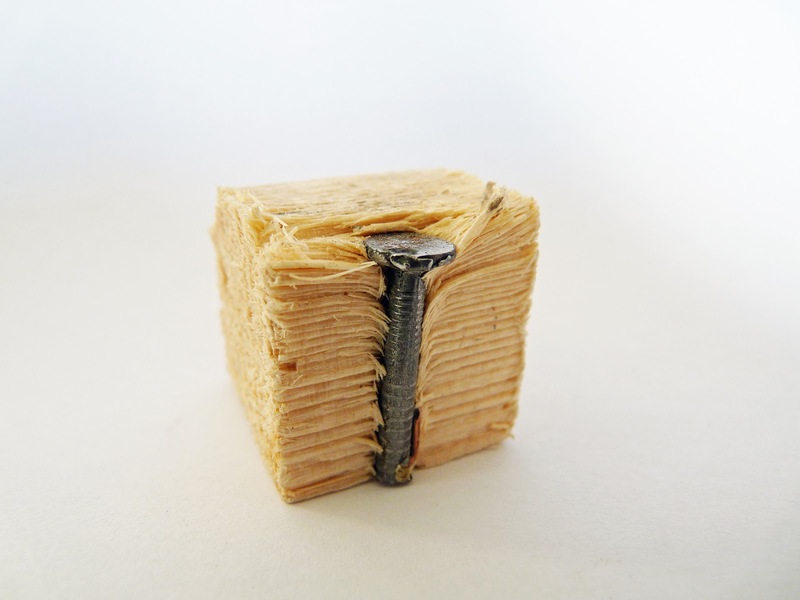 If you haven't a clue what I'm talking about, Pinterest is an online pinboard. You can set up as many boards as you like and use them to 'pin' or bookmark any images, videos or links from around the internet under any headings you choose. These 'pins' and boards are shared with other Pinterest users and you can 'follow' any others' whole set of, or individual boards. A few days ago I decided to get back into art journalling. I haven't done any for ages because I haven't been at all well. 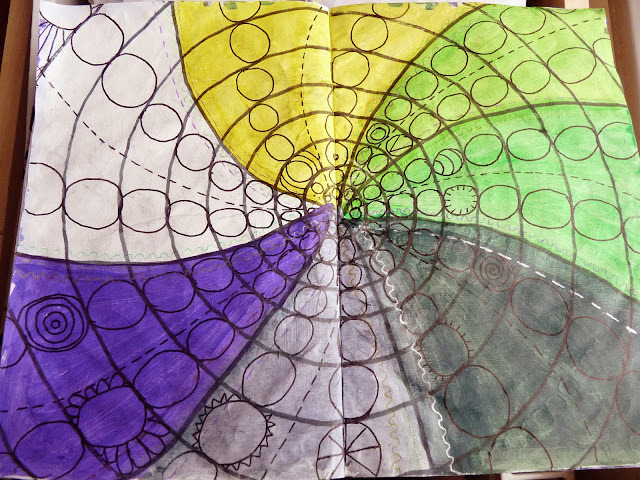 But then I remembered how therapeutic and healing the process of art journalling can be. So I dug out an undrawn-in notebook I've had lying around for ages, and promised myself to either take (with a camera) or make (in my journal) a picture a day. I gave it a name: Screwed. It's pretty self-explanatory I think. The next day I felt a little more inspired having taken the first step and broken the ice. This time I wanted more colour and movement. Going back to my Imbolc colours, I decided to work with this particular palette a little deeper in a similar way to the method I use for Art Affirmations. This time, rather than making an affirmation, I thought I should use colour and shape to explore and develop rather than to affirm anything specific. I thought the process might help me have something to write about for the upcoming Pagan Blog Project 'C' subject... colour!!! I much preferred this piece. 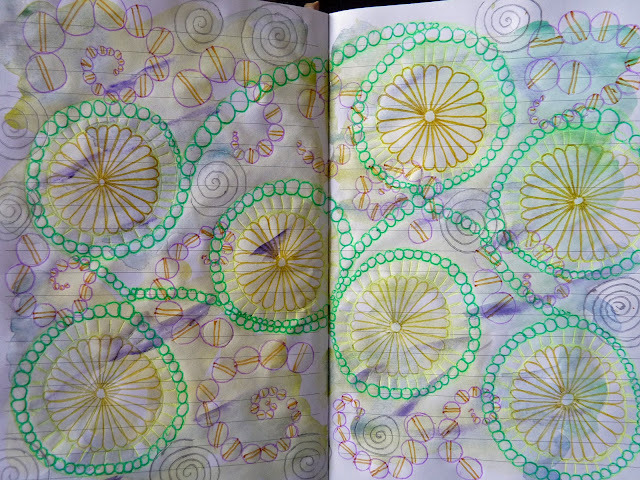 I liked how the colours 'grew' from yellow to green to lilac, and I liked how the whole spiral grew, with the decreasing and increasing circle sizes coming in pulses from the middle out. After doing this piece I felt much more spiritually connected to the season. I felt inspired, creative, and ready to grow. At first I really enjoyed the segmented shapes spiralling out from the centre and moving round the whole page rather than from the inside out like the last piece. But I HATED the colours that emerged from the mix of green to purple. They felt far too muddy and murky and not relevant to the season at all. I always seem to have problems with acrylics. When I tried drawing over the paint in gel pens it didn't have enough impact, so I drew with black felt tip (the only colour I had), and I hated it even more. I do like the shapes of this piece, but the colours and the messiness really grate on me. I felt I had ruined it all and made a bad job worse. I felt much happier after doing this self-portrait. I felt I had tamed the annoying acrylics...or rather used them in a way better suited to their properties. I enjoyed the stronger colours and the less abstract, clearer message, I and felt like I was getting somewhere. Literally putting myself in the picture reconnected me with the spirit of the colours (and therefore the season). Now that the moon is waning, it's not really the best time to make a positive affirmation like this, but it's an affirmation that's pertinent to the time of the year and will see me right through to the Spring Equinox. Choosing and working with this limited palette, has been a challenging exercise, but it has really helped me to grow spiritually closer to what those colours represent to me - the spirit of Imbolc. I'm going to continue working with colour, working out some colour correspondences for different things I wish to concentrate on, and work with them for a while noticing how they make me feel, and using them to help me gain or lose, attract or diminish whatever things in life seem relevant at the time. Why not give it a go yourself? Set up a Pinterest board for your colour correspondences. 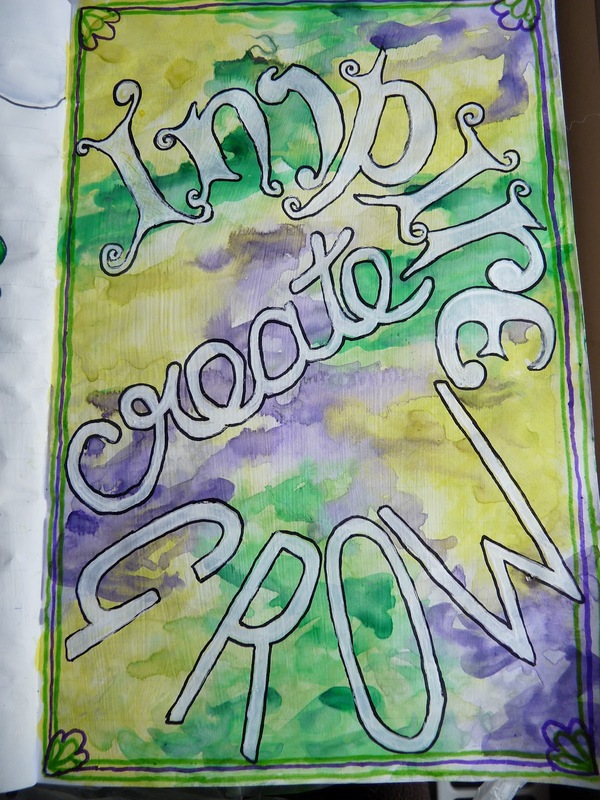 Start art journalling. Remember with art journalling it's the PROCESS rather than the OUTCOME that matters.... so don't get hung up on whether your scribblings LOOK good in the end or not. Focus on how the processes, the colours and the shapes make you FEEL. thank you for this - It was your blog on Art Affirmations that encouraged me to get my pens out - thank you for sharing! That's cool Lesley! I hope you're enjoying it. Wonderful post! I've read that different colors "vibrate" on different frequencies, and also that color is used to cause particular responses from humans. For example, restaurants will paint their walls orange or red to entice people to eat, green is calming, light blue has an initial calming effect but long exposure can cause negative mood, etc. I'm glad to have found you and your blog through the Pagan Blog Project 2012. Great post, love seeing your art journals! 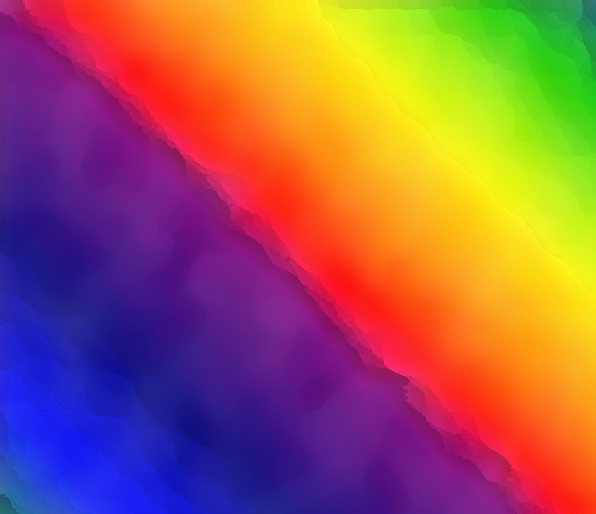 I love colour therapy and colour magic, wanted to write on this topic for PBP too but have ran out of C time I'm afraid! When you began talking about spring - I noticed that some of the colors you were choosing seemed spring like in their intensity. I have never been able to get beyond my yearly collages. 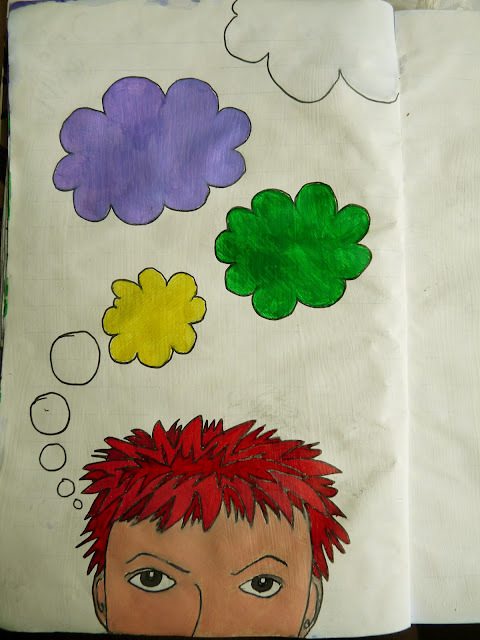 My journal is usually a "mind dump." I have always wanted to try my hand at journaling via colors. I am influenced by what I will do that day - this pushes my color choice. Yeah me too. Having to stick with a limited set of colours in this way was very challenging, but very rewarding. I had to reconcile myself with the colours, despite how I was feeling that day, and I think this is what made the exercise successful in helping me connect spiritually to the wheel of the year (rather than the usual 'mind dumping' or affirmations I usually do in my journal). A week of such a restricted palette was long enough though, and so I'm allowing myself some respite now and choosing any colours again. But I'll come back to this colour-restricted-journalling-with-intent again sometime soon, definitely. Lovely experiment you conducted and shared with us. Just a little side note, the colors you chose are also very common as Mardi Gras colors (which, if I understand, Mardi Gras is about a week away). Mardi Gras is basically the big party before Lent (aka "enjoy it now, then give it up for 40 days"). Ha! Really? Well I never knew that. Thanks for the info! That kinda makes me feel umm..... I dunno.... vindicated perhaps (?) in my choice of colours. :) Which is cool. Thank you!